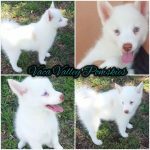 Visit the Vaca Valley Pomskies Facebook page to view available litters, Vaca Valley pinned a post to the top of their Facebook that is updated with available pomskies and upcoming litters. 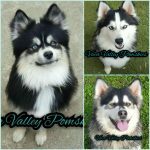 For a direct inquiry, you can contact Vaca Valley Pomskies by email at Vacavalleypomskies@gmail.com. 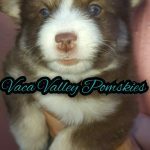 Vaca Valley Pomskies range from $2,500-$5,000 depending on eye, mask, marking, colorings, and coat. 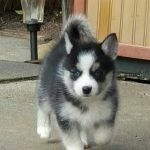 If time permits, Vaca Valley may be available to personally deliver your pomsky to the local airport. Shipping cost is $500 or the cost of travel. 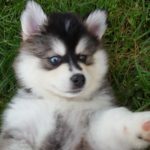 Vaca Valley will not ship any pomskies in cargo. 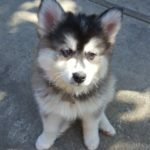 Vaca Valley Pomskies vet is Barney and Russum Animal Clinic. 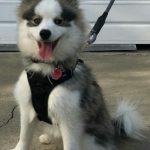 Please use Barney and Russum Animal Clinic as a vet reference for Vaca Valley Pomskies. We want to thank Denise for providing such a wonderful addition to our family! Lucky (formally Axis) has been everything she described! She provided lots video and photos (although I would have loved even more!) of him and his litter-mates to help our family choose which puppy was best for us. She took the time to discuss all of our questions and concerns and offered her opinions on which puppy would be best for us. We couldn't be happier with him! She continues to care about his wellbeing and is always available for any questions we've had. We love our little Lucky! 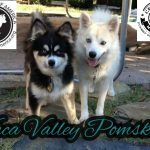 Thank you Vaca Valley Pomskies! I can't praise Vaca Valley Pomskies enough. They put so much love and care into their puppies and it definitely shows when the puppies get to go home with their new families. Bringing our little Kylo (formerly Gunner) home was the easiest transition. He was already crate trained and semi potty trained. We got an in home trainer right away and she praised Vaca Valley Pomskies on their breeding and their care. Kylo is a quick learner and has such an amazing demeanor. He is calm and such a sweetheart. 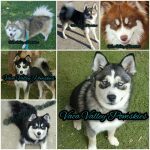 We can't thank Vaca Valley Pomskies enough for all that they do for these little fur babies. Not to mention how available they are whenever we have questions. We feel so blessed for this amazing, first time, puppy experience. 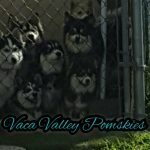 We have had the best experience with Vaca Valley Pomskies and would recommend their puppies to anyone! The in depth application process really shows how much they love and care for their puppies. 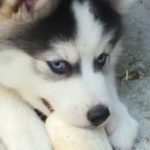 Going to their home to meet all the pups made us feel even better about making the decision to get our pomsky from them. Denise is extremely knowledgable and always available to answer any questions - plus all the puppies are soooooo cute and sweet, makes for a fantastic combination!